Perched in pasture overlooking the rugged Kohala coast is an Architect’s design that truly embodies “bringing the outside in”. Walls of glass allow one to gaze upon the Kohala Country views from the slopes of the mountains to the headlands of Waipio and Waimanu sweeping along the coast north and south. Here is a home where you can watch the changes of the Kohala skies and seas unfettered and in comfort. Seattle Architect Jim Cutler is known for executing organic designs that combine elements of a place into a home. 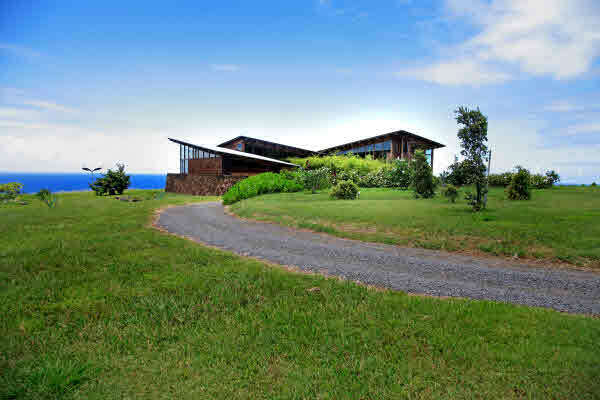 Warm, exotic woods, cut basalt floors and A ‘a rock walls blend with massive columns of wood soaring to the pitched roof designed for the winds of Kohala. The elevated foundation is a tribute to the architecture of the islanders. This unique design was named a “Record Home” by Architectural Record (2007), one of only seven homes in the world to receive this annual award. This home is also presented in combination with MLS#240600 as one property at a reduced combined price as MLS#229636.